Home » Blog » Microsoldering, Motherboard Repairs » Touch IC and other mail in repairs done by our competition. We won’t leave your phone looking like garbage after our repairs. The image you see below is quite a common problem we see with our mail in repairs from other stores. Unfortunately not everyone is trained to do micro soldering and board repairs, and the outcome of unqualified attempts at repair, like the picture below of a mangled Touch Integrated Circuit Chip (IC) having too much heat applied and having the heat spread through the board to the underside of it and causing a whole bunch of resistors and capacitors to lose their connection and cause secondary issues, some of these components have even fallen off and become disconnected as a result of the heat. This can have some major effects on your device including blank or malfunctioning camera, proximity sensor fail and even stopping sound from coming out of your speakers or earpiece. 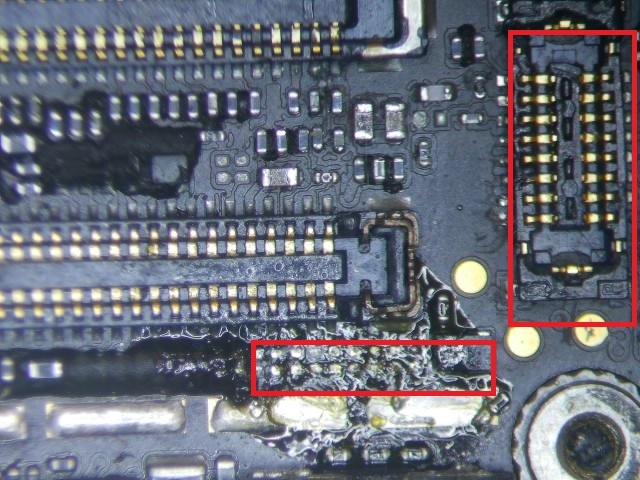 So when you need to get your phone repaired, remember even the simplest job can have the most damaging results if done incorrectly by an under-qualified technician. A One Mobiles & Repairs have been repairing phones for over 18 years in Geelong and have a great reputation for getting the job done fast and all our repairs are done in store! We do all our repair ourselves and don’t send off your device off to third party repairers. You will see our guys in the back working away on the microscopes and soldering stations. Common repairs like the tristar IC which is the chip that gives you connectivity to external devices like your computer and music docks or even HDMI capable TVs and Monitors. Some repairs including backlight repairs and touch IC repair (commonly referred to as Touch IC Disease, when not attempted by another repairer can be turned around alot quicker. When you receive mail in repairs that have NOT been successful this is what they more often then not look like. So contact one of our COMPETENT technicians at A One Mobiles and we will always give you the highest quality work possible.